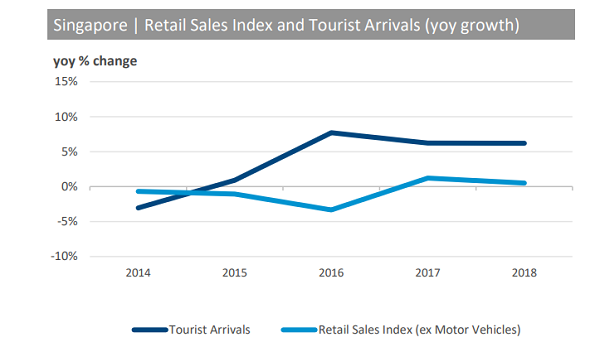 This chart from Colliers International showed that the steady 6.2% YoY increase in tourist arrivals in Singapore cushioned retail sales in 2018 amidst cautious consumer spending. The retail sales index increased by 0.5% in 2018, data from the Singapore Department of Statistics (SingStat) revealed. In 2018, computer and telecommunications equipment fell 3.8% YoY amidst a dearth of new gadget launches, after rising 1.7% in 2017. On the other hand, there was sustained strength in the medical goods and toiletries segment which rose 5% YoY. Tourist arrivals clocked in at 18.51 million in 2018, rising steadily since 2015. According to Colliers, growth was driven primarily by increased arrivals from the American and European markets at 13.6% and 11.3% YoY, respectively. That being said, Asia continued to make up the greatest proportion of tourists at 76.9% in 2018, led by China, Indonesia and India.